My name is Takashi Tanemori, and I welcome you to my Website. 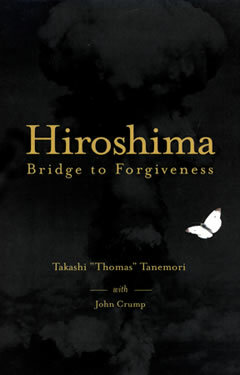 My journey, chronicled in my book Hiroshima: Bridge to Forgiveness has been long, difficult, and inextricably linked to the seeming opposites of hatred and love. In my path from Hiroshima, conflicts have shaped and redirected me, today allowing me to express my love and gratitude for two countries that both nurtured and wounded me. The result of these tribulations has been the greatest gift: a solution to human conflicts, a rite of passage created through forgiveness. My life story demonstrates how a heart twisted by hatred and revenge can be transformed by forgiveness, evolving to a path of peaceful wisdom and the essential work of healing human hearts. My life-mission and goal are rooted in my Father's teaching, "Live your life for the benefit of others. Then, we will all benefit." I believe this universal principle is the key to living peacefully with each other. 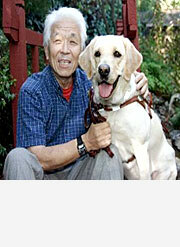 Even though I am now almost completely blind due to the late embers of the naked sky of Hiroshima, when I first saw with the "vision of the heart", I finally understood that I am at last, truly able to see. When I had an epiphany two decades ago, I was convinced that forgiveness is the first step toward peace, as it defines our relationship with the Divine Creator and sustains all human relationships. No matter what, you can choose to forgive. We all face this challenge in our daily lives. As a survivor of Hiroshima, my firm belief is in a clear and simple message - - we can settle individual human conflicts and differences of national enmity, ethnic hatred, and cultural divisiveness without resorting to violence or war. There need not be any endless cycle of revenge. When we are able to conquer the raging war in our own hearts, one-by-one, what Japanese people call: kokoro no yutori – yasuragi (peace in the heart or inner peace). This inner transformation is much more powerful than any atomic weapon in shifting the world toward peace. I believe that inner-transformation can make nuclear weapons and war fall by the wayside! Website Design Copyright © 2011 Michele Productions. All Rights Reserved.